What Is The Workers' Compensation Insurance System? Workers' Compensation is a required, state-controlled system of compensation to employees who suffer from job-related injuries or illnesses. Workers' Compensation benefits provide medical coverage and income replacement for injured workers. It can also help train workers for other jobs if they are not able to return to the same work after their recovery. In exchange for compensation, the company is protected from being sued by employees for workplace conditions that may have caused these injuries. Workers' compensation is paid for by employers' contributions to either private or government Workers' Compensation insurance. Each state determines their state system's employee eligibility requirements, payment schedules and rehabilitation procedures. 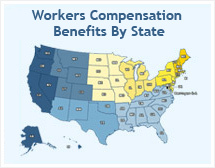 Although each state's laws are different, the concept of Workers' Compensation insurance is the same - that the employer should take responsibility for the costs of illnesses, injuries or deaths that happen on the job, regardless of who is at fault, and that the employee should receive a partial, tax-free replacement for their lost income. Filing a Workers' Compensation claim can be stressful and confusing. An applicant attorney will fight for your rights and get you the maximum benefits that you deserve. Click here for a FREE evaluation by a Workers' Compensation applicant attorney. Learn whether your injury qualifies you for benefits. Find out more about your state's guidelines. Get a free claim evaluation by a qualified attorney that knows the complex laws of your state.